For more than a century, study after study has confirmed two simple yet powerful truths about the relationship between immigration and crime: immigrants are less likely to commit serious crimes or be behind bars than the native-born, and high rates of immigration are not associated with higher rates of either violent or property crime. Unfortunately, immigration policy is frequently shaped more by fear and stereotype than by empirical evidence, which is why immigrants are so often treated like dangerous criminals by the U.S. immigration system. Whole new classes of “felonies” are created which apply only to immigrants, deportation is viewed as a just punishment for even minor crimes, and policies to end unauthorized immigration become more and more punitive rather than more rational and practical. In short, immigration itself is being criminalized. This is the context within which recent news reports of the “detention bed mandate” should be viewed. As reported by NPR, U.S. Immigration and Customs Enforcement (ICE) has been instructed by Congress since 2009 to fill 34,000 beds in detention facilities across the country with immigrant detainees every day. Needless to say, this sort of inmate quota would never fly if applied to the native-born population in the criminal justice system. As the NPR story puts it: “Imagine your city council telling the police department how many people it had to keep in jail each night.” Clearly, this is a ludicrous notion that has nothing to do with fighting crime or protecting the public. But when it comes to the detention (and deportation) of immigrants, very different standards of justice and reason are at work. 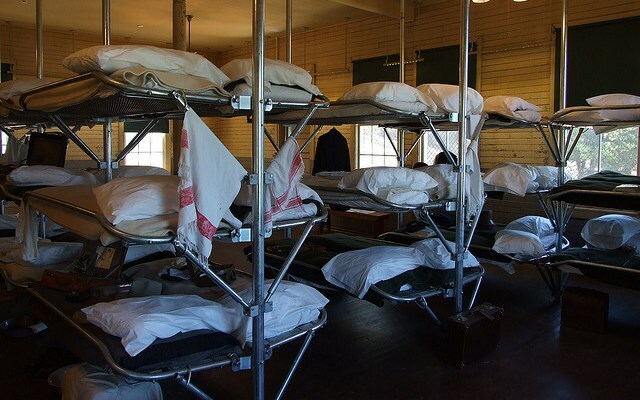 The detention bed quota is symptomatic of a much broader phenomenon that law professor Juliet Stumpf calls “crimmigration”—the “criminalization of immigration law.” In this respect, 1996 was a watershed year. The Illegal Immigration Reform and Immigrant Responsibility Act (IIRAIRA) and the Antiterrorism and Effective Death Penalty Act (AEDPA) transformed immigration law in two profound ways. First, the laws mandated the detention and deportation of any noncitizen (legal or unauthorized) who had been convicted of an “aggravated felony.” Second, the laws redefined what constitutes an “aggravated felony” for immigration purposes, and applied this new standard retroactively to offenses committed years before the law was enacted. So if a lawful permanent resident of the United States had been found guilty of cheating on their taxes in 1985, had paid a fine and not been sentenced to any jail time, the government might lock up that person and deport him or her for that offense today. To call this a miscarriage of justice would be an understatement. Although this standard has been applied to immigrants for more than a decade and a half, it has taken on new meaning in recent years thanks in part to the dramatic expansion of a program known as Secure Communities. This is a Department of Homeland Security (DHS) program which seeks to identify deportable immigrants in U.S. jails. Under Secure Communities, an arrestee’s fingerprints are run not only against criminal databases, but immigration databases as well. If there is an immigration “hit,” ICE can issue a “detainer” requesting that the jail hold the person in question until ICE can pick them up. Not surprisingly, given the new classes of “criminals” created by IIRAIRA, most of the immigrants being scooped up by Secure Communities are non-violent and not a threat to anyone. Moreover, as the program continues to metastasize throughout every part of the country, more and more people are being thrown into immigration detention prior to deportation. The detention-and-deportation machine is also being fed by Operation Streamline, a program in the southwest under which unauthorized border-crossers are prosecuted in group trials and convicted of illegal entry into the country—a misdemeanor. If they cross again, they may be convicted of a felony and face up to two years in prison. Not surprisingly, a system like this, which is based on mass trials and the manufacture of non-violent “felons,” dehumanizes the immigrants who are trapped inside. That is why it is easy for some Border Patrol agents to jokingly refer to the holding cells in which border-crossers are kept as hieleras, or “ice boxes,” because of the low temperatures to which they are subject at night. Detention-bed mandates and ice-box holding cells are signs of an immigration-enforcement system run amok. Deportations during the Obama Administration are rapidly approaching the two million mark. Families and communities are being needlessly torn apart in the process. And each year, billions upon billions of dollars are spent on border and interior enforcement, while hundreds of migrants die in the deserts and mountains of the southwest trying to cross into the country from Mexico—sometimes while trying to reach their families in the United States. These are tragedies that could be prevented—if only Congress would choose to inject a little humanity back into the immigration system. Photo Courtesy of Simon Allardice.